Teaser #3: Why Should You Choose Me? Kal goes grocery shopping and receives an unexpected message. Teaser #2: What Am I Doing? Business marketing efforts continue and a visitor comes knocking. Teaser #1: Who Am I? Kal's initial business marketing efforts. Mixed results. Kal’s neighbor requests assistance regarding a particularly scaly problem. After an amateur wakefulness spell causes a client more problems than it solves, Kal steps in. A mother asks Kalila for a spell to ease her son’s performance anxiety. A review of miscellaneous cases. Kalila receives a message. Kal helps a client who has lost all feeling in their body after an astral projection session. A fan episode. Introduction to the storyteller and X from the Girl in Space podcast gets a tarot reading courtesy of Lisette Alvarez. A particularly wary man seeks Kal’s assistance in dealing with his romantic and trust issues. A wealthy family wishes to make contact with their deceased patriarch after a dispute over his will. A treatise on tricksters, show updates, and a very special (mandated) event request. Special thanks to the producers of 2298 and to all the KSEMS Patreon and Ko-Fi supporters. Desiree Onasis returns for another session. A brief update on the show and me, Lisette. Also, a deep-ocean tarot reading from the crew of the Rusalka. Kalila must unravel the story behind a woman whose soulmate can’t remember her. A girl comes to Kalila to help her mother get a job. Kalila receives a very serendipitous voicemail. A woman asks Kalila to save her relationship with her girlfriend, who has grown distant. Desiree Onasis begins a new journal at the bequest of Aphrodite. They also uncover some worrying information about a certain witch that upsets what they thought they knew. The anonymous saboteur has gone too far. Kalila resorts to drastic measures. 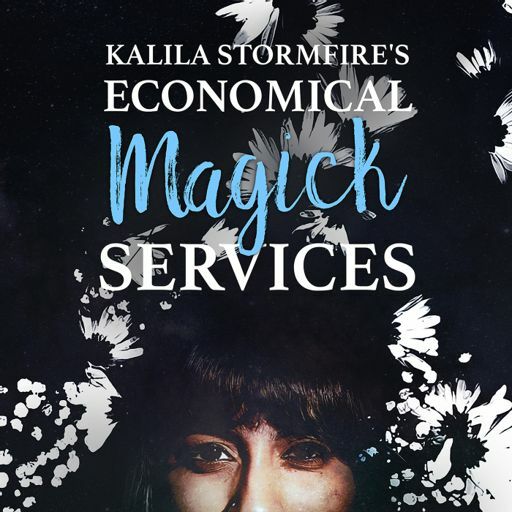 Kalila Stormfire is forced to face her choices; past, present, and future. Desiree gives an update on their ancestor work with Janelle Grimmer. Written and produced by Lisette Alvarez. Desiree Onasis is played by Zayn Thiam. Music by Ondrosik and Ketsa. Gloria Sousa is having a rough week. Clarence Twinner is just trying to run some errands with his faithful friend, Nala. A new tarot reading for the new year. Featuring also: Season 2 premieres in April! The Season 2 IndieGoGo campaign ends January 31st! I'm going to PodCon! Kalila's life, her losses, and her love defines who she is. This is a story of what happened before the ritual that changed her life.